Monteith's Golden is a refreshingly smooth lager brewed to an authentic Munich style. 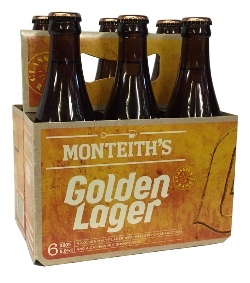 By today's standards, Monteith's Golden Lager is a rich golden colour, slightly darker than more modern 'mainstream' lagers. This lager recreates traditional rich, nutty malt characteristics, balancing them with mellow hops for a taste experiance that is truly memorable.